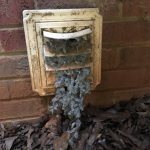 Thought about how your dryer vents the moisture from drying clothes lately? If you’re like a lot people, probably not. It’s like when the water heater goes when you have family visiting from out of town, out of site out of mind, till a problem arises. A dryer needs a clean line to vent the air and moisture properly outside of your home. If the line isn’t clean, either via lint build up, birds’ nest, or other obstruction, it causes the dryer to work longer to the dry the clothes. This extra time puts stress on the heating element, which could create a situation where the dryer and/or the line gets overheated creating a potential fire hazard. A clean line improves efficiency, reduces dry time, reduces utility costs, and most importantly reduces the risk of fire. Maintaining your homes dryer vent line is as important as changing the oil in your vehicle. If you fail to change the oil, it will eventually get so dirty and ineffective that it will cause your engine to seize. The same can happen to your dryer vent line, but with potentially greater consequences. 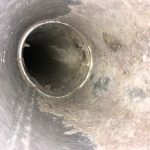 So how often should you have your dryer vent cleaned? If you have a large family and do a lot of laundry weekly, you should have it cleaned once per year. If you do laundry less frequently you can go longer between cleaning, but it should be no longer than 2 years. Contact MJL Services LLC for all your dryer vent needs. We are not a high-pressure sales company. We provide excellent service at reasonable prices. You will deal directly with the owner, who is focused on complete customer satisfaction.